Have you noticed the picture of the natural beauty on the right side of my page? I want to bring to your attention the contest going on over at OHM Body, the natural beauty company whose product I blogged about in recent times. 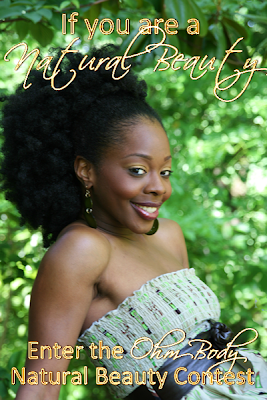 OHM is calling on you natural beauties to send in a photo, either a headshot or a full body picture. Now I have been to many of your blogs so I know you have some natural beauty shots. A photo and profile feature in the Love Letter for the month of her win. A full photo feature on the Ohm Body front page website. An Ohm Body Gift mailed right to her front door. Simply click on the natural beauty picture on the right side of my page for more details! Hey James lol you're a mess. I Haven't seen you in a while. I have a post just for guys coming up this week. Wiz yes I think it's a great thing. A Tube Around Your What? Smelling good from head to toe. It smells good enough to eat! How can you not be HAPPY?